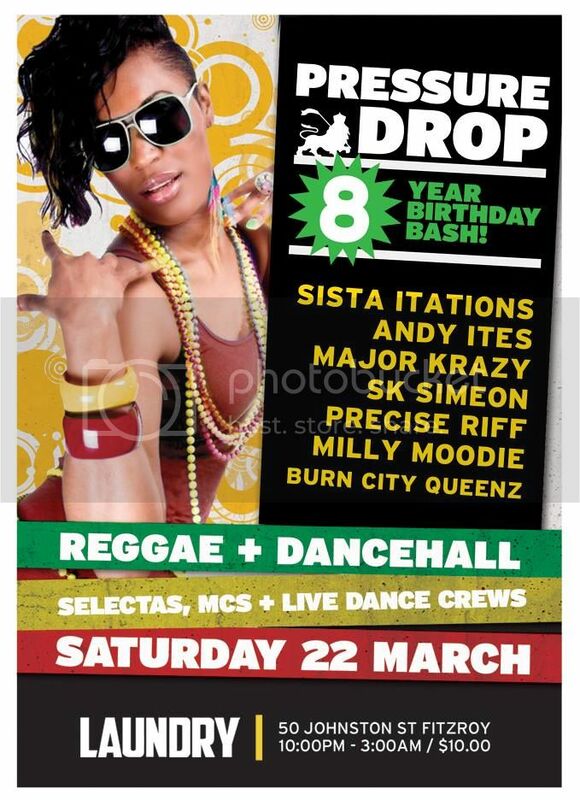 Eight years ago, Pressure Drop debuted on Melburn's calendar with a focus on classic dancehall and banging party vibes. And from humble beginnings, Pressure Drop has gone on to become one of Melburn's favourite reggae and dancehall events. Eight years on, the hype is still strong - and on Saturday 22nd March, Sista Itations, Andy Ites and King Krazy are joining forces to revisit the music and vibes that made Pressure Drop so fierce! Sista Itations and Andy Ites will be running the tunes all night - plus King Krazy will be making a long-overdue return from Northern New South Wales. Plus Melburn's fiercest dance crew, Burn City Queenz, keeping the dance floor hype! Reach before 11pm for special birthday giveaways!